Who hasn't at some point uttered the words, "Poor me"? We all have our problems. We have all suffered defeats, losses, burdens of life. At any given time, lamenting one's own fate seems justified. However, let's remember an old proverb: "I was furious at having no shoes, so I met a man who had no feet." This past weekend while surfing the Internet, I ran across the story of a young woman, a story so horrifying that it made me think I have no right to ever articulate the words "poor me" under any circumstances. 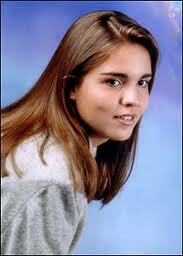 Jacqueline Saburido, born in 1978 in Venezuela, went to the United States in 1999 to study English. On September 19, 1999, she went to a birthday party and after two or three hours, she and her four friends decided to go home. During the drive, their vehicle was hit by an SUV driven by a man, Reginald Stephey, 17 years old, who was drunk. Two passengers were killed immediately; the other two were only slightly injured. Jacqueline was trapped in the car, one foot stuck underneath his seat. The car caught fire and Jacqueline suffered burns over 60% of her body. The consequence of this tragic accident, Jacqueline lost all the fingers of both hands, hair, ears, nose, lips, eyelid of the left eye and most of her sight. Since the accident she has had more than 50 surgeries and supposedly, others will follow. I saw a picture of this woman, this girl of 19 years before the accident: pretty, full of joie de vivre, someone who seemed to have a promising future. Then I saw a picture of this woman after the accident. Should I be ashamed? My first reaction to this picture was revulsion and nausea. This young woman was disfigured to the point where I had trouble recognizing her as a human being. It was terrible, saddening. The question came to my mind as to whether it would have been better to see her die in the accident. I could not imagine how she could continue to live in these circumstances. The radical change in her life, her fate sealed forever in the wake of the accident. This story defies description. I thought she would find life overwhelming. The First World War was brutal and I had opportunities to see pictures of mutilated soldiers: half a face missing, a jaw missing, the loss of the nose, eyes, and the most horrific injuries I had ever seen. I think this was the beginning of modern surgery. It was scary; to look at these mutilations reminded me how war is devastating. If we were all forced to look at these photos or to meet people face to face, would we be willing to remove the sword from the scabbard? This is the first thing that came to mind when I saw pictures of Jacqueline. A person is injured so badly, so devastatingly, how can we imagine, conceive that this person will one day have a normal life again in every sense of the term? The aftermath of this accident was that the driver Reginald was sentenced to seven years in prison. He was released in 2008. Jacqueline went to the U.S. where she continues at this time to use her story and her photos to promote a campaign against drunk driving. She learned English. She has been a guest on Oprah Winfrey. She maintains her own website. Regarding the driver, Jacqueline had the opportunity to meet him just after the trial in 2001 that sentenced him to seven years in prison. Jacqueline said that Reginald had completely destroyed her life, however, she forgave him. Even when Reginald got out of prison in 2008, Jacqueline repeated that she did not hate him. If this story can teach us a lesson, what exactly is this lesson? We talk from time to time of a second chance in the context of where a particular person deserves it or not. - Oh, I missed my job, can I try again? Can I get a second chance? - We must remind ourselves that sometimes there is no second chance. We have only one life. If we lose it, there is no possibility to get another. Jacqueline is still alive. However, the second chance she has is not the same as we have when we miss work. It was an experience that has totally changed her life, the only life she has. For me, I cannot think of a single experience of my life that resembles the experience of this woman. I must express my gratitude for never having experienced such a thing. In fact, faced with such a history, I should never dare express aloud "poor me". On 20 April 2019, Saburido died of cancer in Guatemala City. Her family stated that she had moved to Guatemala a few years previously seeking better treatment for her illness. Saburido is to be buried in Caracas. According to TxDOT's Faces of Drunk Driving Campaign, Saburido’s story had been told to at least one billion people world wide by the time of her death. 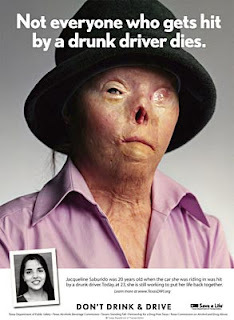 Jacqueline "Jacqui" Saburido (born December 20, 1978) is a Venezuelan burn survivor who advocates against drunk driving.